One of the much scarcer products from Carlton Ware in the Novelty Ware series. 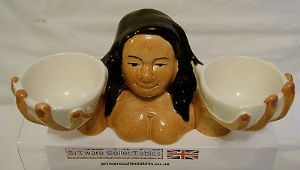 Designed by Roger Michell (Lustre Pottery) for Carlton Ware, this particular item is from the very much sought-after Circus Series, this one being a Double Eggcup in the form of a Strong Woman. The small series series was produced only during the 1980s before being discontinued. The Eggcup is based on a white ground with brown and black paintwork for highlighting the Strong Woman features. It measures 6.5 inches (16.5 cms) in width. It is in excellent condition with no evidence of crazing.